When I sat in the NICU chair the day the doctors gave me Tristan’s diagnosis of Down Syndrome, I was overwhelmed with a flood of thoughts and emotions. The entire situation was just sad, altogether. From the silence in the corner of the NICU, the whispers between nurses, the way the doctor revealed the “news” to me. My reaction. It was just all sad, and it was all negative. After she gave me the news, through the tears, I did manage to utter the words “how did this happen?”. Her response was this: “There was nothing you did to cause this, it was just a genetic mishap, a chromosomal abnormality”. She meant no harm. She was trying to be professional and comfort me, even though she may not have even known the answer herself. But after she left, I did not know how to process that information. A mishap? You mean, a mistake? Why would God allow this? How does this match up with my faith, as a Christian? So many questions. There is the logic side in my mind, that says we live in a fallen world full of disease and disorders, and it just so happens that maybe this chromosomal “accident” happened inside of my body at conception. Somewhere, somehow, a mistake happened and an extra chromosome was formed. OR, there is the other side that I have known to be true since the day I became a Christian. Psalm 139 says that God forms life in the womb. He has control. He knows. He meant for it to happen. Now, almost 3 years later, I still do not know how to process that information. Would I change Tristan? No. Would I take away that extra chromosome if I had the chance? Never. Am I proud and happy to be his mom? You bet. Although I love my child with every bit of my beating heart and consider myself blessed, I still struggled with that lingering question. Was Tristan supposed to have Down Syndrome? Is Down Syndrome in the category of disease, abnormalities, disorders? Was this just a genetic mishap, or did God put that Chromosome there? What will we tell Tristan when he is old enough to ask us the question about why he has Down Syndrome? I refuse to tell my son he is a mistake, and I refuse to tell him something I do not believe deep down. So I sat in my bed one morning and told God that I need him to answer this for me. I need Him to settle this in my heart, and make it clear. So, He did just that. That same night, in the check out line in Target, a woman from across the store came running, with a giant smile on her face, eyes locked in on my little Tristan sitting in the shopping cart. Without saying hi, she immediately said to me with excitement, “I have one too. My grand daughter. Can I please hold him?” Of course, I said yes. She knows. She is part of the very few people in this world that loves someone with Down Syndrome. So she held him, she talked to him, took his picture, and she had a blast for the next 7 minutes. It just so happens she was from Illinois, passing through New Jersey. When she was saying goodbye, she placed her hand on my shoulder, looked me in the eyes and said “He is a blessing straight from God. We are chosen and blessed people.” I sighed. I smiled. I said “Thank You”. Then she left. My heart rested. I believe He sent that stranger from Illinois to me to confirm what He has been telling me all along. After I read these verses, I knew. God challenged me that moment to stop “trying to figure it all out”, and settle my heart on what I know to be true, and what He confirmed. He formed Tristan. He is not a mistake. He wanted to accomplish specific purposes in His own specific ways. He is uniquely made, and He designed Tristan to be the exact way He was meant to be. So, that evening in my journal I wrote a letter to myself from God. I wanted to remember what He told me. I wanted to refer back to this on the days I begin to doubt and wonder. I also wanted to share this with the world, so that they stop seeing Down Syndrome as a mistake. So this is what I wrote…I believe it is from God’s heart to mine. I knew you before I created this world. I knew your husband too. Even though some days you might not think so, I created you for each other, and I knew that you would be stubborn ones who try to do things without my help. Between the two of you, I knew you would have a lot of lessons to learn. I knew that you would have a mind of your own, and not let people too close. I knew you would doubt Me, and search for Me, constantly even though I told you I will never leave you. I knew that your husband would sprint through life without stopping to smell the flowers. I knew that you would struggle with depression. I knew that your husband would be impatient. I knew that you would be too serious, and lack joy. I knew you were going to be a perfectionist. I knew that your husband would have difficulty expressing emotion and showing compassion. I knew exactly what you would need, in order to believe in Me and my Word. In order to trust me, and in order to see beauty the way I created it. In order to embrace who I created you to be, and the purpose for your life. I knew what you would need to keep you smiling, believing, trusting, hoping…despite what this world might say. I knew what you would need during your darkest days, and I knew what you would need to keep you accountable, and point you back to Me…your Creator, Protector, Provider, Father, and Friend. I knew that you would have a first born son, named Jael, who would be a strong-minded, intelligent, independent old soul who grounds you and brings wisdom to your life. I knew that he would be patient, sensitive and mature. I knew that he would see things differently than some kids his age, and be accepting. I knew that he would have 46 chromosomes and be “attractive” to the world’s standards. Actually, I gave most humans in this world 46 chromosomes. You all like to call this “normal” or “typical”… but remember, “normal” is a man-made word, based out of fear & insecurity, that is used to help people feel validated and place others in categories. To me, there is no normal. I created all of you in my image, and you are all beautiful. I knew that you and your little family were comfortable and happy, and had plans to add one more. I knew that you had a dream of what your next child would be like. You even pictured in your mind, his beautiful big round eyes, tan skin, curly hair, athletic & healthy build. You were expecting him to have 46 chromosomes. You wanted me to keep your life comfortable, but I wanted so much more for you. You had faith, but not enough. It wasn’t sincere. It wasn’t as deep and as real as I knew it could be. It was comfortable faith, but not the faith that gets you though dark times. You didn’t trust me, but I knew you would eventually. I knew what you all needed, so it was time for me to do what I planned to do. So I created a little boy named Tristan. I sent him to your family on September 7th, 2013. He was perfectly chosen for you, for countless reasons that you will only see if you open your eyes and heart to Me. I gave him an extra 47th chromosome, which only means one thing to you all down there on earth. But it means something else to me. 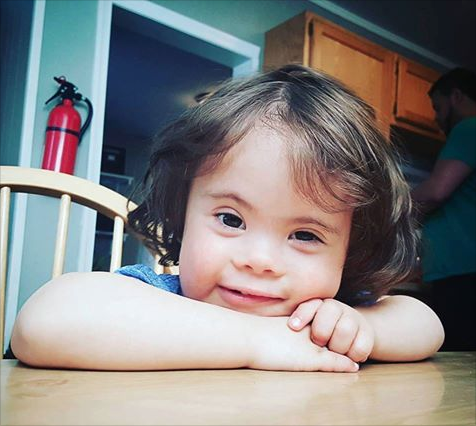 To the world you live in, Down Syndrome is a mistake. Science says it’s a genetic mishap. Doctors told you it was an accident. People feel sorry for it. It is feared, misunderstood, disrespected, and made fun of. It comes with many difficulties, and they say it is a burden. It is viewed as stupid and slow. It is hated and not taken seriously. It is considered “less than”. So much so, that 92% of mothers who find out their child has it, kill it before it even gets a chance to show it’s true self. I tried to tell them to trust Me, but they didn’t listen. If they only could see what I see. I was trying to bless them. I was trying to help them overcome things that have been holding them back for so long. I was trying to bring joy to their lives. I was trying to bring marriages back together, and bring families closer. I was trying to help them learn patience, understanding, compassion, love, and most of all….I wanted to show them that I loved them, and specifically chose them to receive this precious and rare gift. I wanted to bless them. But they didn’t let me. Instead, they chose to see only what their eyes could see. A mistake. A life not worth living. You see, some of the most amazing things I’ve ever created are most opposed by evil. Down Syndrome is one of those things. Although those babies are here with me now, laughing, dancing, singing and playing…. they never got the chance to fulfill their earthly duties and change the people around them. If the other 92% were allowed on the earth, it would be a much better place. Now because you live in a fallen world with imperfect bodies, susceptible to disease and sickness, there will be some symptoms and and “imperfections” that come with the presence of that chromosome. But I have provided a way for you to help Tristan overcome anything he faces, with prayer and proper support and nutrition for his body. I will also place some very important and amazing people in his life that will help him grow, and be well. He CAN and will be healthy, and those symptoms do not have to negatively effect his progress and his purpose. But most of all, I placed specific abilities in that 47th chromosome. The ability to choose JOY, in all circumstances. The ability to say what is meant, and mean what is said. The ability to overcome and persevere, despite countless obstacles and opposition. The ability to shine light in places that have none. The ability to see & understand things in spiritual realms, that other people can’t. The ability to make people smile, with one glance. The ability to see good, where other people see bad. The ability to slow down and enjoy the little things in life. The ability to NOT be corrupted by the world’s standards of beauty, strength and intelligence. The ability to LOVE deeply, fiercely and unconditionally, despite hate. ANd….The ability to forgive quickly, without blame or grudge. All of these abilities are seen in the very people that are said to have a “disability”. And you, as “normal” human beings, struggle to achieve even ONE of these things. I chose you and your family to have Tristan. I know that you needed this gift, and that you would learn things that you never would have learned otherwise. Although it took you some time to see past your fear and ignorance, you accepted the gift…and you have embraced it. Don’t ever question, don’t ever doubt. Don’t ever let the world tell you that he is a mistake. If you allow me, I will reveal so many beautiful things to you, and they will change your life forever. You will be so changed, that you will have no choice but to come out of your bubble, and tell everyone around you. Tell them. Show them the truth. Let the world see him, and know him, so that they have a chance to experience the blessings that come with the gift. That extra 21st chromosome was placed there by my hands. It is not a mistake. Science will never be able to delete it, or prevent it. That’s because I meant for it to be there. They will call it Down Syndrome, and they will try to stop it’s existence….but they won’t succeed. It is a special gift that I will continue to give, only in hopes that people will accept it. 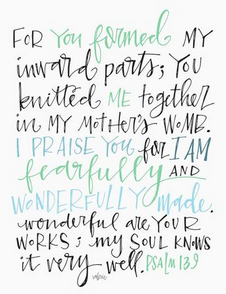 Rejoice, my sweet daughter, you have been given a precious gift, and he calls you “momma”. Remember, what this world considers “less than”, I consider great. From “A Letter from God About Down Syndrome” on www.Tristan21.com.